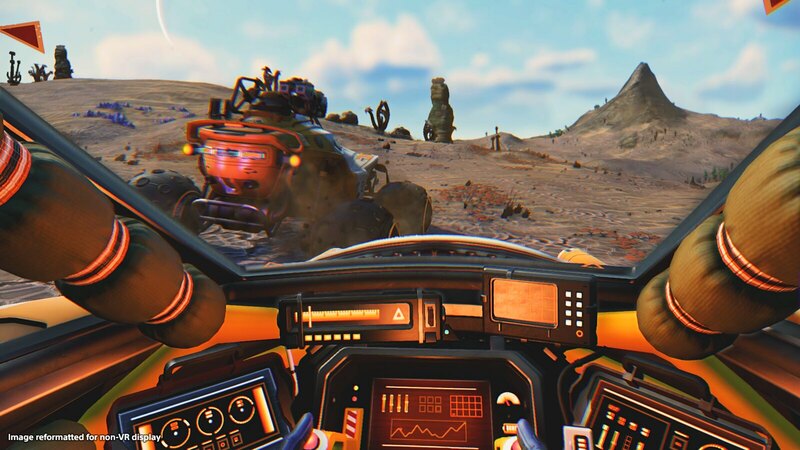 The small, Guildford-based team at Hello Games has put in extensive work to rebuild the interface around VR — the demo I played was even set up with dual PS Move motion controllers. Using this control scheme, holding up your left arm and pointing at it with your right hand brings up a menu with your standard options (Quick menu, torch, mining tool, etc.). Hello has also implemented teleportation-based controls for getting around: Just hold the left move button to manipulate a marker that you can place anywhere within around 30 in-game feet (by my approximation). In a clever touch, rotating your right wrist before letting go of the left Move button will allow you to adjust your orientation before initiating the teleport. All the tools and upgrades you’ve accumulated in the No Man’s Sky universe are present, including the Terrain Manipulator. Just reach your right hand behind your shoulder and squeeze the Move controller’s trigger to grab it, then point and click to reshape the topography in front of you. Having 1:1 control here should be a boon for all you creative types — especially when perfecting the custom design of your home base! Climbing into the cockpit (fully built out for VR — nice!) of your trusty starship and exiting a planet’s atmosphere is a powerful experience, and it’s even more stunning in virtual reality. 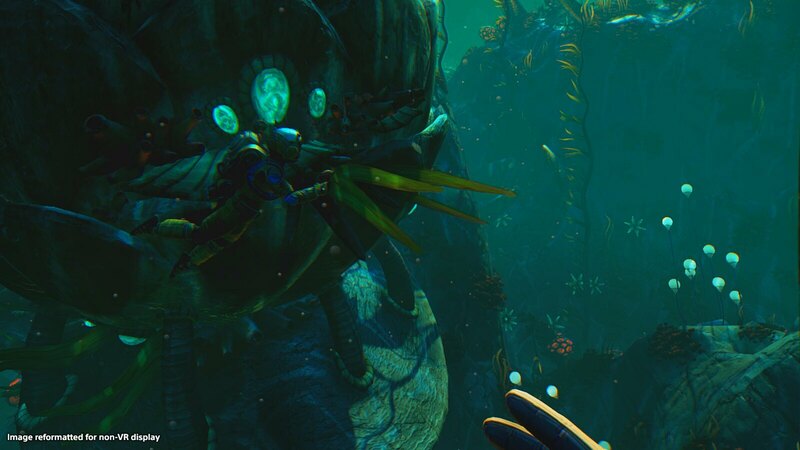 Punching the thrusters for the first time in VR felt similar to the first time I did it in the original game: surprisingly kinetic, and wholly exhilarating. Ship controls have been revamped for VR, too: manipulate the ship’s throttle with your left hand, and its flight stick with your right. Need to cover a lot of distance in a little time? Hold the left Move button to boost, or hold both Move buttons to activate your Pulse Engine for a dramatic speed increase. Looking around in the midst of a high-speed jaunt through the stars, pink and purple streaks zipping past the sides of your ship, is a sci-fi dream come true. 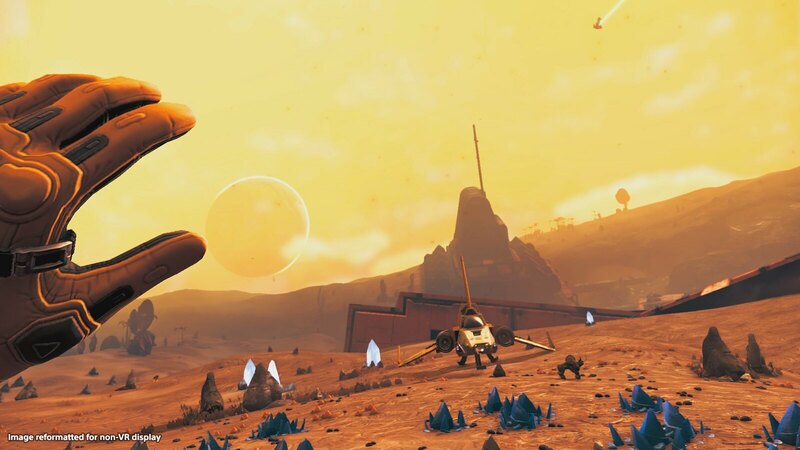 I’ve enjoyed checking in on No Man’s Sky as Hello has continued to evolve and improve the game, but the addition of VR support may be the catalyst that gets me to sink dozens more hours into exploring its endless universe. 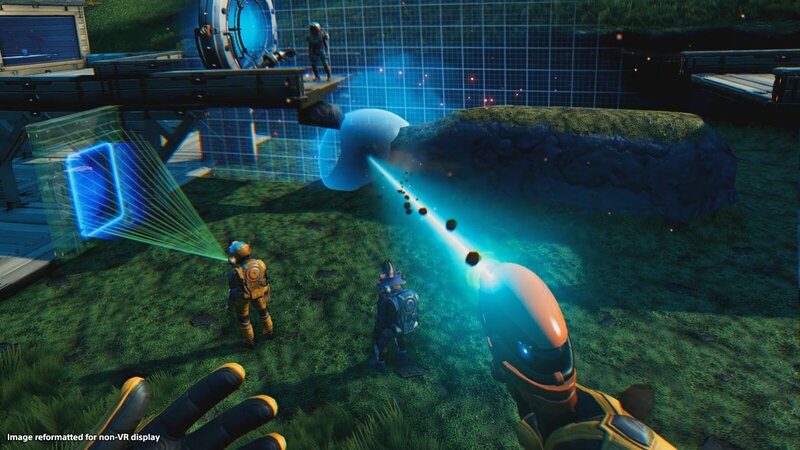 Learn more about No Man’s Sky’s massive upcoming Beyond update here, and stay tuned for more info as we get closer to its summer launch.